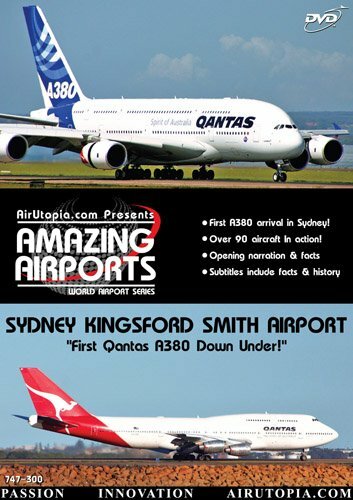 AirUtopia : Sydney First Qantas A380 Airport Video DVD-(Airport, airliner, plane, airplane, aircraft FILM)! 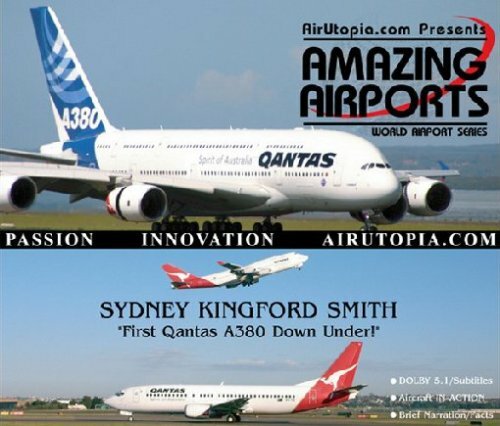 Absorb all the astonishing sights & sounds Australian aviation has to offer with this thrilling video highlighting airliner activity at Sydney's Kingsford-Smith Airport (YSSY). Among the fascinating footage, this 85-minute DVD captures the debut arrival - and first takeoff - of flag carrier Qantas' initial Airbus A380. You'll also witness the distinctive livery and up-close operations of a host of air carriers from south of the equator: Virgin Blue, Air Pacific of Fiji, Hawaiian, Air Nauru, Air Caledonie, Air Niugini, and more - over 90 aircraft in all! Additionally, the video includes subtitled narration of facility facts & history. An exciting peek at aviating Down Under that every airplane enthusiast is sure to appreciate.